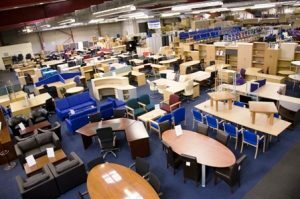 Office Furniture Centre Ltd has Scotlands largest showroom of new and used office furniture Glasgow. Visit our well stocked new and second hand office furniture showroom in London Road, near Bridgeton Cross, Glasgow G40 3AS, or call 0141 556 7600 to arrange a free site visit to your premises. Established in 1986, we supply new and used office furniture throughout Scotland on a daily basis. Call us on 0141 556 7600 or ontact us by email with a rough idea of what you are looking for, and we will come back to you with the used office furniture and second hand office furniture that we have in stock to match.